Mr. Scrappy is a low cost multi-purpose disposer tool that functions as a handy scraper to remove food from plates and a plunger to push the food into the disposer. 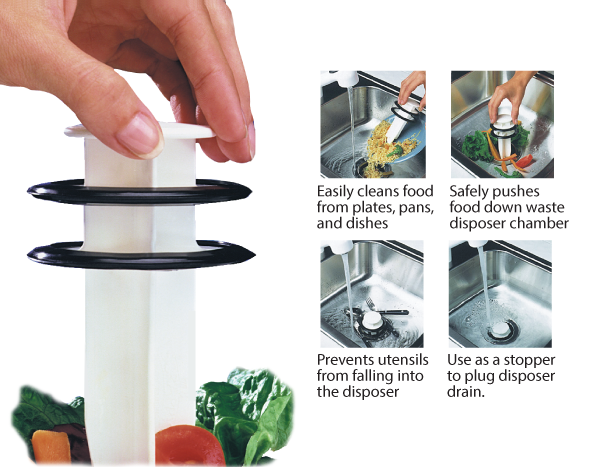 It also functions as a stopper to plug the drain opening and when not in use, it acts as a cutlery guard, keeping silverware and other small items from falling into the disposer, while allowing the sink to drain normally. Mr. Scrappy Tool - Free Shipping!